Iraq’s Prime Minister Haider al-Abadi says he will not hesitate to strike terrorist bases in Syria, or terrorists in any other neighbouring states if they pose a threat to his country’s security. Fighting terrorism is an international and regional responsibility, and not merely the responsibility of Iraq. Terrorism now threatens the whole world, and not only Iraqis. 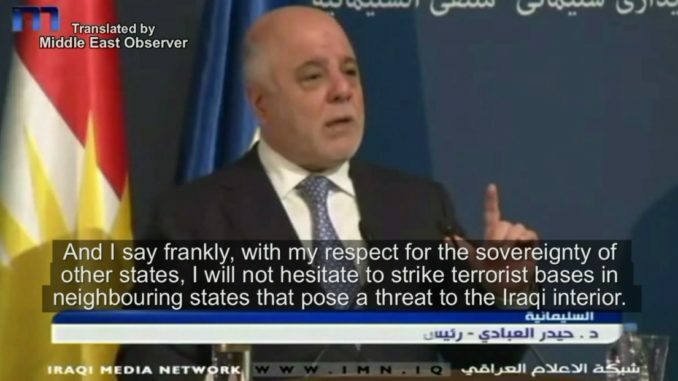 And I say frankly, with my respect for the sovereignty of other states, I will not hesitate to strike terrorist bases in neighbouring states that pose a threat to the Iraqi interior. One last time: I respect state sovereignty, rather, I secured the approval of the Syrian government to strike terrorist bases in the Syrian (city) of Abu Kamal, because these terrorist bases are the ones that prepare the car bombs which (terrorists) send to Baghdad and the remaining Iraqi cities in order to carry out acts of terror. If you notice the nature of the makeup of our security forces and armed forces is not offensive – so as to attack another state. The Iraqi constitution prevents this. The Iraqi constitution even forbids the aiding of sides within Iraq to carry out aggressive acts on a neighbouring state. I am committed to the constitution, and God willing all politicians are committed to it, because we swore the constitutional oath to commit to the constitution and to abide by Iraqi laws. Therefore we abide by this. We only seek to build an army that will safeguard and protect Iraq from any threat.